Keeping Halloween "green" is no easy task. Cheap, plastic-y costumes are for sale everywhere. There are aisles of Halloween candy for sale at the grocery store. There are school parties and trick or treating. When you are trying to be healthy and environmentally friendly, it is a bit overwhelming. I am no expert, but here are some of the things I am going to try to do this year. 1. The costume. Make your own costume. You don't have to know how to sew to do this. Get creative and use stuff you already have around the house. 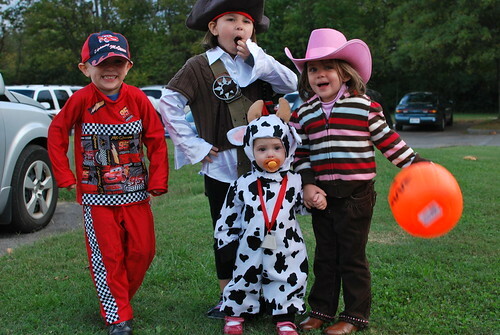 If your house is like my house, we have tons of dress up clothes that can be transformed into Halloween costumes. If you aren't finding what you need at home, head to a thrift store. I know this is a hard one so no judging here if you opt to buy a costume. Just try to get something that you know they will wear again for dress-up or a costume that can be passed down to a sibling or friend. Also don't forget to check with friends anf family to see if they have anything that you can use. 2. Trick or Treating. These ChicoBags are really cute, but really you can use just about anything. When I was growing up we used a pillowcase. Have your kids decorate the pillowcase using washable markers. Last year Harper decorated an oatmeal container and used that for trick or treating. 3. Candy or treats. There are an endless number of options here. Greenhalloween.org is a great resource and will give you some great ideas for food and no-food items. My rules are buy organic, fair trade chocolate or candy that has no artifical coloring and no preservatives. The fewer ingredients listed the better. You can always buy non food items, but to me this ends up being junk I have to clean up later or throw away. I bought 2 bags of candy from Yummy Earth about a month ago when it was on sale at Whole Foods. 4. Dealing with the stash. So now you are home and have all this candy, now what? Have the kids dump out their loot on the floor. Go ahead and let them indulge a little. I believe everything is ok in moderation. We usually let them pick a couple of pieces of candy that they can eat right then. The rest is put away. We don't eat candy very often at my house so this is not a big deal yet. We just recently threw out the candy from Halloween last year. Once the kids are in bed you can go through the candy and weed out the stuff you don't want them to have. Save the rest for very special occasion treats. After a couple of weeks the stash can mysteriously disappear. At least that is what is going to happen at our house. Anyone else have any green Halloween tips to share? Well, you know I make my kids' costumes. :) Great ideas! We used pillowcases growing up, too. Last year I bought some Halloween fabric on clearance after the fact, so I'm planning on making the kids little bags to go trick or treating with. As for the treats, we let them gorge themselves that night and then the candy quietly sits for an occassional treat until it is thrown away.